What do we do in the Dynamic Environment & Ecosystem Health Research group? Listed below and under "Research themes" on the right are several research themes under which all of research in my laboratory falls into. We are not constrained by location: we currently have or have completed projects across Canada and around the world, with major projects in Nova Scotia, the Laurentian Great Lakes region of North America, China and southern Argentina. Currently, we are starting a major new initative looking at the aquatic ecosystem impacts and potential remediation of historical gold mines in Nova Scotia. The DEEHR Laboratory owns or has access to a wide range of instruments and gear for field sampling and laboratory analyses. For example, we operate an DMA-80.3 Tricell Mercury analyzer for trace to highly contaminated mercury analyses of many environmental samples in a customized Class-100 cleanroom laboratory with ultra-pure (18 ohms) and reverse osmosis water systems. For sample preparation, we have a Retsch Ball Mill Mixer MM 400 in a biosafety cabinet and a Ethos Closed-Vessel Microwave Digestion system. We also maintain a 6-probe YSI water quality profiler sonde for rapid in-situ water physiochemical measurements for saline to freshwater sites. For data analyses, modelling work and mapping projects, we maintain two computer servers with GIS and statistical software. 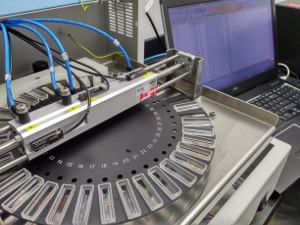 We have access to multi-elemental analytical instruments through collaborations with colleagues at SMU, other universities and government agencies as well as through SMU Centre for Environmental Analysis and Remediation. Check the list of DEEHR members and alumi under "People" for insight into the range and type of research projects carried out by our group. Usually I will assign projects to incoming graduate students based on the student's motivation and capacity, grant availability and funding requirements. Also, because my research interests encompass a broad and inter-disciplinary area, I am also open to new ideas and innovative science. I am willing to supervise students and work with postdoctorate fellows on original projects of their own development, provided that their aims fit within the scope of the laboratory. If you are interested in any of the DEEHR projects and research themes listed here or would like to discuss ideas for original projects, then e-mail me at 'lm.campbell at smu.ca'. Please always include your C.V. / resume and a statement of your general research interests with your initial inquiry. Prospective graduate students will have the choice of entering the interdisclipinary Masters of Applied Science (MSc) program or the PhD program in the Faculty of Science at Saint Mary's University. Co-supervision with other professors, either within SMU or with other institutions are always a possibility. Note that graduate students with their own funding will have a significant competitive edge so prospective candidates are strongly encouraged to apply for various scholarships and researchships. To get started, check this link out. Prospective honours thesis and summer undergraduate students should consider SMU summer student job postings for our laboratory posted via SMUworks and on the front page of this website (under "News"). Successful NSERC USRA summer research award holders will also be VERY seriously considered. But pay attention to those deadlines -- many summer jobs and award deadlines are often in February. Prospective postdoctoral fellows are welcome to contact Dr. Linda Campbell. Funding for postdoctoral positions is highly competitive, and researchers with their own funding will always have an edge. If there is funding available for a postdoctoral position within the DEEHR group, then an announcement will be posted on the home page of this website and other relevant sites. Our group are working on series of projects across Nova Scotia and Atlantic Canada to investigate spatial and temporal trends in mercury contamination in fish, birds, long-finned pilot whales and bats, in collaboration with Nova Scotia Fisheries & Aquaculture and Environment Canada. We have worked closely with the Ontario Ministry of Environment and Environment Canada on a series of challenging projects designed to merge complex contaminant databases and to map mercury distribution in sport fish across Ontario and Canada. Due to historical industrial and mining practices and changing environmental policies, there is a legacy of contaminated sites across Canada and around the world dating back to 1700's to 1800's or even older. Our group conduct research on the bioavailability and extent of the contamination at those sites. Currently, we are investigating mercury and arsenic contamination and quantifying food web bioaccumulation around a 1800's historical mining & stamp mill site in Dartmouth, Nova Scotia. We also have investigated historical contaminated sites in Kingston, Ontario, in the St. Lawrence River and the UNESCO World Heritage Site Rideau System, and have published a series of papers related to those sites. Lakes and rivers across North America and around the world have been impacted by non-native species, both introduced (e.g. brown trout, smallmouth bass) and unwanted species (e.g. zebra mussels, Chinese mystery snails). Many of these species are fundamentally changing the ecosystem and the food web structure in lakes. In Nova Scotia, we are examining the role of invasive smallmouth bass and chain pickerel on food web dynamics and mercury transfer in collaboration with Nova Scotia Fisheries & Aquaculture. Our research aims to investigate how the food web structure and transfer of elements (e.g., "trophodynamics") in regions impacted by non-native species has changed over both time and space. Since many metals and contaminants also biomagnify through food webs, changes in food web structure can also affect the ultimate contaminant burden in top trophic fish so we also are investigating biomagnification rates and environmental parameters which influence the amount of contaminants in top trophic species. Investigations into the biogeochemistry and food web transfer of mercury and other metals is a fast-growing field. Even so, many important questions remain unanswered. Our lab will undertake research into movement and transformation of metal and mercury species in the environment. Biomagnification and biogeochemistry of various potentially toxic elements (silver, arsenic, selenium, lead, zinc) as well as alkali metals (rubidium, cesium, potassium, sodium) in lakes are also being studied. Potentially toxic elements typically have complex chemistry where only some forms are toxic to living organisms. Understanding the biogechemistry of systems which could reduce or promote the toxicity and bioavailability of those elements is necessary for our ecosystem and human health. Studies on metals of volcanic orgin and how those are being transferred through food webs are being carried out in beautiful Nahuel Huapi National Park in the southern Patagonia region of South America. 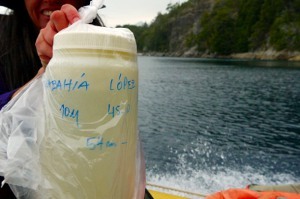 We have been investigating bioaccumulation trends for assorted metals in the pelagic food webs of large lakes, including Lake Nipigon, Lake Simcoe and Lake Champlain in Ontario, Lake Nahuel Huapi in Argentina and Lake Tai and other lakes in China, and will extend this investigation to Nova Scotia lakes. Research into metal and food web ecology is often artifically isolated from studies on relationships between aquatic ecosystem and human health. Humans often (but not always) contribute the bulk of environmental stressors on aquatic ecosystems, while contaminants, reduced fish biodiversity and poor water quality impact human populations. Our work has spanned continents. One of our projects has investigated the the human health and socio-economic implications of elevated Hg in sub-Saharan Africa. This has led to a collaboration with University of Ghana looking at the implications of medical soil geophagy and relationship with ethnic and traditional medicine use. We also have investigated the relationship between fish consumption and relationship to metal concentrations in fish consumers' hair in China and Canada. Human health concerns often involve social concerns and how we regard environmental issues. We have investigated how social and environmental concerns enabled the effective development and application of the Remediation Action Plan (RAP) at two Great Lakes Areas of Concerns (AOC) at Cornwall, ON and Bay of Quinte.